Archaeologists have found the first historical evidence for Chinese takeout: a pot filled with 2,400 year old soup. Despite the fact that the ketchup in my fridge seems to last forever, most foods deteriorate long before anyone comes along to dig them up. 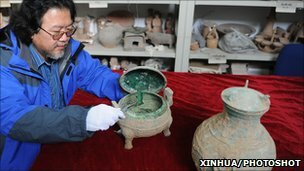 That was not the case in the Chinese city of Xi'an because a sealed bronze pot was recently unearthed near where the famous terracotta warriors were discovered in 1974. Inside the pot was a green mess, but the archaeologists quickly realized that the bits of bone and liquid were most likely a soup and that the oxidation of the copper metal in the pot was what had turned it all green. The pot was found in a tomb that was found while making way for a local airport and, judging by the age surrounding sites, Chinese archaeologists believe that the pot dates back to almost 400 B.C. That is some seriously old soup. I wonder if it's still hot and sour? The tomb, while not as lavish as the necropolis built for the emperor nearby, may have been for a minor noble or military commander. Tests are currently underway to determine what materials are in the soup and this will provide the kind of information on eating habits and cooking practices of ancient Chinese that is rare for archaeologists to learn. "It's the first discovery of bone soup in Chinese archaeological history," said Liu Daiyun of the Shaanxi Provincial Institute of Archaeology. "The discovery will play an important role in studying the eating habits and culture of the Warring States Period." This period in Chinese history, generally 475 B.C. to 221, was marked by warlords conquering smaller states until the nation was unified under the Qin Dynasty. The First Emperor of the Qin ordered many monuments constructed, including the Great Wall of China and the Terracotta Army.